The Guys of Lidar ranked the Laser Interceptor as one of the best laser jammers sold today and retails for $599.00. Here is your chance to get one for your car or truck for FREE! Don’t be an April Fool and miss this opportunity to outfit your car/truck with the very best in laser jamming. Once you’ve signed up, you’ll automatically get a chance to join us on Facebook and Twitter. All you need to do is enable the contest app to begin spreading the word online with your very own contest link. You’ll earn points when you put your contest link and ANYWHERE online and get people to click and visit RadarDetector.org. 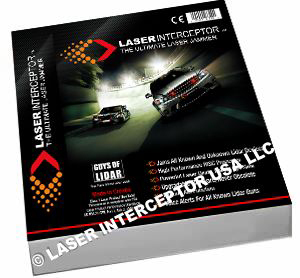 The more actions you take to promote our Laser Interceptor Contest Giveaway, the more chances you have to win! This is a contest that REWARDS the most active contestants, as each point represents a single entry for a chance to win. You have until 11:59 PM (pacific time) on April 1, 2011 to create as much online buzz about this amazing contest before a random selection of all post winners takes place. Point Leaders will have the highest odds of winning, but everyone that plays gets a chance! We encourage you to SPREAD THE WORD to as many people that you know, but please participate within these simple guidelines to make it fun, fair and exciting for everyone. We reserve the right to make adjustments to this list, adjust your points or even ban you from the contest for using spammy tactics to promote this contest. Good luck to everyone! Now go out and start SHARING YOUR LINK!